Lomé, 1st August 2018. Nigerian President Muhammadu Buhari was elected by his West African peers to chair, for the next one year, the Authority of Heads of State and Government of the Economic Community of West African States (ECOWAS), in replacement of Togolese President Faure Essozimna Gnassingbé, who spent close to fourteen months at the helm of the regional organisation. 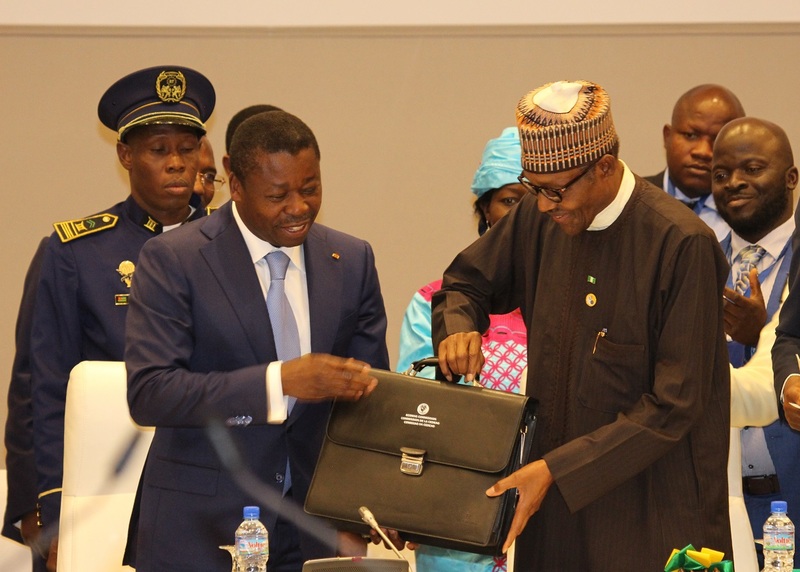 This was one of the key decisions of the 53rd ordinary session of the Authority held on Monday 31 July 2018, in Lomé, Togo, graced by 12 of the 15 ECOWAS Heads of State. Benin President Patrice Talon, Malian President Ibrahim Boubacar Kéïta and Liberian President George Manneh Weah did not attend. Aside from the election of Muhammadu Buhari, West African leaders decided to hold their 54th ordinary session in December 2018 in Abuja, Nigeria. Other major summit decisions focused on the free movement of persons and goods, the Economic Partnership Agreement (EPA) between West Africa and the European Union, ECOWAS institutional reform, security challenges in the region, and the creation of monetary union. Regarding the creation of the monetary union, the Authority urged Member States to continue the implementation of sound economic policies in order to comply with convergence criteria for the creation of the ECOWAS single currency. In the area of free movement of persons and goods, the Heads of State directed the Commission to take necessary initiative to reduce the obstacles to free movement and present a report to the political authorities of the relevant Member States. On EPA, the Lomé meeting noted that the failure of some Member States to sign the EPA and the implementation of interim EPAs, pose significant challenges to the regional integration process. In that regard, it called on the European partners for greater flexibility on the issue of the EPA, in particular the implementation schedule of the interim EPAs. Concerning the African Continental Free Trade Area (ACFTA), the meeting welcomed its launch, and took note of the signing of the Agreement by several African countries. To that end, it called on Member States yet to do so, to fast track their signing processes. It instructed the Commission to provide assistance to Member States, in order to arrive at a regional stance on pending matters such as tariff concessions, list of specific commitments in the area of services and rules of origin. Furthermore, the Authority welcomed the emergency mobilisation measures of the Regional Food Security Reserve and urged beneficiary Member States to confirm and honour their commitment to replenish the stock. Still on agriculture, the summit expressed grave concern over the upsurge in violent conflicts between herders and farmers due to transhumance, and strongly condemns the significant loss of human life caused by these conflicts and the stigmatisation of targeted segments of the population. On security, the Authority reiterated its condemnation of terrorist attacks in the region and expresses solidarity with the affected countries. It reaffirmed its determination to relentlessly counter terrorism and violent extremism. It commended the commitment of member countries of Multinational Joint Taskforce of the Lake Chad Basin Commission and the G5 Sahel Joint Force in the fight against terrorism. 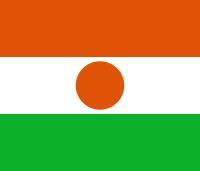 It appealed to Member States to provide material, financial and technical support to the armed forces of member countries engaged in the fight against terrorism in the Lake Chad Basin and the Sahel. 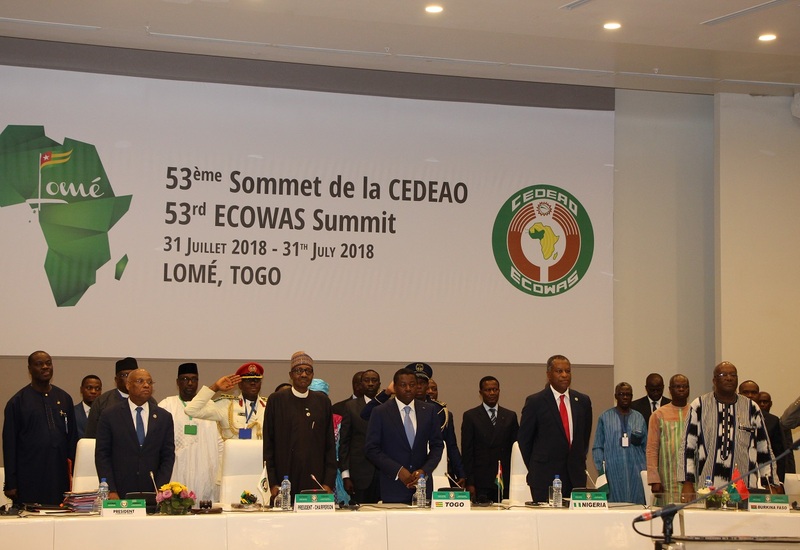 The Authority welcomed the conduct of the Joint Summit of ECOWAS and ECCAS Heads of State and Government in Lomé, Togo on 30 July 2018. 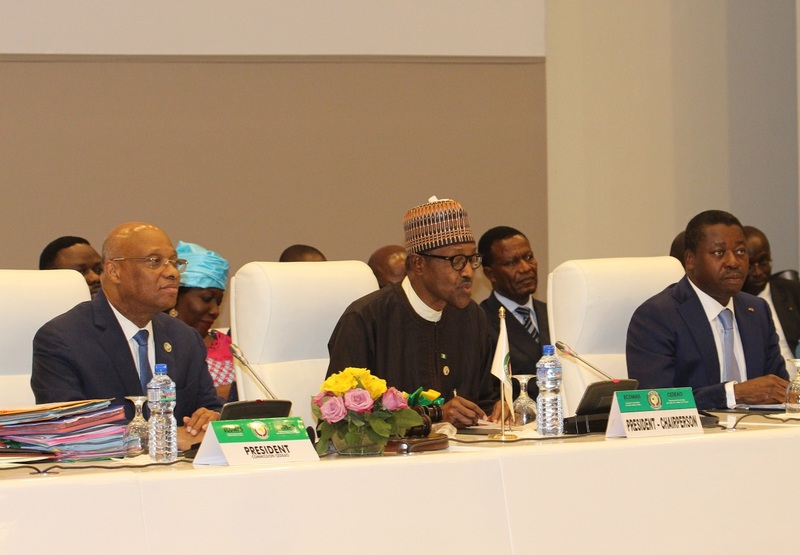 It urged ECOWAS Member States and the Commission to promptly implement the decisions contained in the Lome Declaration on peace, security, stability and the fight against violent extremism adopted by the Joint Summit. In Guinea Bissau, the summit welcomed the significant progress in resolving the political impasse and decided to lift the sanctions imposed on some political stakeholders in the country. The Heads of State also urged political stakeholders and civil society in Guinea Bissau to respect the date of 18 November 2018 for the organisation of the legislative elections. On The Gambia, the Heads of State welcomed the positive political developments in the country, characterised by the successful conduct of local elections on 12 May 2018. Regarding Mali, they congratulated the political parties on the peaceful conduct of the 29 July 2018 elections, and urged the political stakeholders to maintain a spirit of patriotism and respect the outcome of the elections. 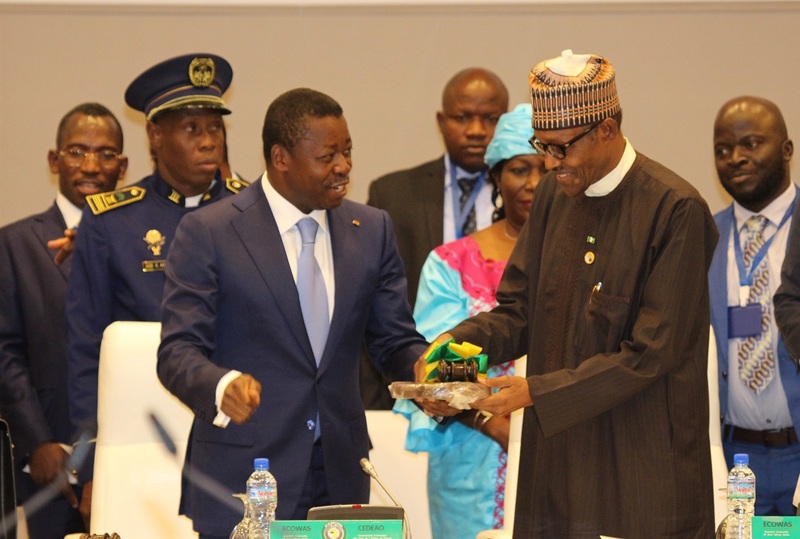 On Togo, the summit condemned any use of violence and called on political and civil society stakeholders to refrain, in all circumstances, from acts and comments likely to fuel new tensions and undermine ongoing efforts. the government and political stakeholders to pursue efforts to adopt constitutional reforms, taking into consideration the following issues: two-round voting system for the presidential election, a two-term limit for the President, reconstitution of the Constitutional Court, in particular to review its composition and limit the term of office of its members, and consolidation of the electoral process. The Authority recommended the adoption of these reforms through the Parliament, in order to speed up the implementation process. Where necessary, the reforms will be submitted for electoral consultations.